Dimmer Button: adjust the brightness in different situation. Magnetic Base: 4 Ultra strong magnets enable it to stick firmly to any metallic surface. Extended Fold-away Handle: provide more possibility for everyone. 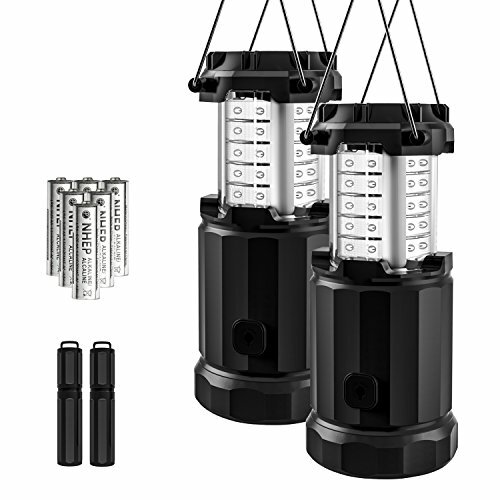 Battery Powered: coming with 3 AA batteries in each lantern, easy for change. Locking Handles: Avoid accidentally activating and wasting the lantern's power. Storage Space: using up top spare space for on-hand tinder, batteries or other small accessories. Fire Starter: great buddy for your adventure camping, hiking etc. NOTE: It is not recommended to use the lantern in sub-water.